Edinburgh-based Delphian records is one of the UK's most enterprising, lively and inspiring labels. 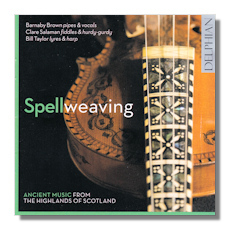 Here is a CD of "early" music celebrating the traditions of the Scottish Highlands. The hour and a quarter's worth of intimate music contained on SpellWeaving forms the first volume in the "European Music Archaeology Project" (EMAP). This is an extended (five years) collaborative effort funded by the European Union Culture Programme whose aim is to explore common European heritage through its sounds and music. The project involves the reconstruction of instruments as well as performances and an exhibition. Delphian is commissioned to make five CDs by its partners, Dr Rupert Till and the University of Huddersfield. If they are all as musically enthralling as this, we're in for a treat. The Delphian catalog already has details of those in preparation or released. This CD is emphatically not, though, a swirling watery "ambient" hodge-podge of atmosphere and recreation. Rather, it's a set of carefully-conceived pieces of enjoyable music as "collected" in Colin Campbell's Instrumental Book of 1797. This is a trove of 25 hours of music notated in a way which aimed to preserve a unique unwritten tradition from the remote, self-contained and confident world of Northern and Western Scotland before, after and during the notorious repression by the English in the eighteenth century. Ironically, it was members of the English gentry who commissioned Campbell to undertake the collection in the hope that the ancient classical music of the Gaels would be preserved and not lost as the patronage of pipers in particular ceased after the "'45", the Jacobite rebellion against the power and brutality of the (Protestant) royal line which had supplanted the Stuarts. This is complex music pitching intricate ornamentation against long mesmerizing lines of a range of (blown, bowed and plucked) instruments. It gently yet assuredly reflects the strengths and stabilities of the oral culture dependent on arduous apprenticeship – not least by privileging the way in which styles of instrumentation and vocalisation influenced one another. There are long passages of repetitive, catching and minimally-changing melodies ("The Horse's Bridle Tune" (Port na Srian) [tr.6], for instance). But they are far from monotonous: you are really in the world of the unself-consciously honed and so of the shining recollections of an aged grandparent. Although completely different in sound and register, the inward-looking intensity of early mediaeval French song is perhaps the closest analog; or the long directed melodic variety of Morton Feldman. Never hurried, the players have approached these realizations with deliberation and meticulous reproduction of the intricacies and subtleties of the music; not a carefree attempt to overwhelm us with "quaint" instruments under duress. The choice of instruments has had to be of this century. But it's based on the indisputable bedrock of ancient European popular tradition: the stringed frame and the tube. So there are two types of pipe, a flute, two fiddles and three lyres/lutes and the hurdy-gurdy, played by these three sensitive and enthusiastic musicians. On the other hand, the probable novelty of music played on essentially plebeian objects (although the "Rose harp" is hardly simple) never allows the inventiveness and melodic and harmonic integrity of the music presented here to be hidden. Instead, Brown, Salaman and Taylor convey the very essence of music which is sufficiently sure of itself as a living tradition so as almost not to need the fuss and light of preservation. This is affecting, deceptively plain yet in fact (the CD repays careful repeated listening) complex creation. One senses that the intricacies and subtleties (all admirably brought out by these instrumentalists and singer) played a major part in preserving and even re-inforcing the senses of self of the Gaelic culture at the time in which this music was "captured" by Campbell. Neil Gunn's novel "Butcher's Broom" conveys the same closeness and confidence in the way in which members of the Highland Clans spoke, worked and managed their world – until threatened for ever by the Highland Clearances… the resulting implicit quiet insistence in the viability of their way of life and pride in the Gaelic culture can be heard in the other sung piece, "The End of Inchberry Bridge" (Ceann Drochaid' Innse-bheiridh) [tr.8]. The CD contains eight self-contained works varying in length from just over three to fifteen and a half minutes. This is not "folk" music arranged for effect. Nor modern extraction of pre-existing "trad". The repertoire here consists of undiluted arrangements by Brown. And ones which have lost, we have to assume, little or none of the color and spirit of the music as originally conceived and as it evolved. It should come as no surprise, then, that one key virtue of this music is variety: there are slow and fast pieces, vocal and instrumental, a bevy of time signatures and different combinations of texture and register. After all, Brown plays Highland bagpipe and bone flute as well as employing the Gaelic "chanting" method, canntaireachd; Salaman the Hardanger and mediaeval fiddles and hurdy-gurdy; Taylor the Highland clarsach (a 26-string harp), and both wire- and gut-stringed lyres. The acoustic on this CD is close and focused – as befits the concentrated nature of the music throughout. There are "sound effects", but used extremely sparingly… water at the start to set the scene. Your attention is completely directed to the instruments, how they work, and the ways in which their qualities convey the purely musical. No "sound stage". The short booklet contains necessary introductions to the music and its origins and social and historical context as well as extracts from the scores and illustrations and descriptions of the instruments with brief bios of Brown (who also wrote the essay), Salaman and Taylor. This repertoire, particularly played with such finesse and precision – which nevertheless loses nothing of the original music's relatively humble origins and unpretentious grounding in the world from which it sprang – is unlikely to be familiar to many. It's well worth exploring and expecting to be delighted and surprised by its compelling story.